USC Beats UCLA, Heads to Rose Bowl? O Happy Day: Kellogg Saves Mother's Cookies! HAUNTED HONEYMOON stars Robert Montgomery as Dorothy Sayers' amateur detective Lord Peter Wimsey, with Constance Cummings playing Lord Peter's bride, mystery writer Harriet Vane. The film is in MGM's great tradition of bantering mystery-solving married couples, including the THIN MAN and SLOAN mystery series. Montgomery and Cummings' interplay as the newlywed Peter and Harriet is delightful, as is their interaction with Leslie Banks as their friend, Inspector Kirk, and Seymour Hicks as their devoted, ever-calm manservant, Bunter. My only real quibble with the film is that after a most promising opening sequence featuring Peter and Harriet, we then spend far too long watching the setup of the crime they will later solve. This means the viewer spends a good ten minutes or so watching a variety of unlikeable characters, with Peter and Harriet nowhere in sight. It's a slow and uninteresting stretch in an otherwise very entertaining movie. I don't know if there is a better way the filmmakers could have handled the exposition, but I wish they'd found it. Some reviewers I've read complain about Montgomery's lack of a consistent British accent and consider him miscast, but as I've not yet read or seen a Wimsey mystery, I had no preconceptions about the character and simply enjoyed Montgomery as the charming nobleman with a penchant for solving crimes. He brings to the role an elegance that makes him seem British, even if he doesn't quite sound British! Cummings appears to be every inch the proper British lady, but in reality she was born in Seattle, Washington. She appeared in roughly 20 pre-Code films, including Frank Capra's AMERICAN MADNESS, before abandoning Hollywood and moving to England with her British husband. From that point on, the majority of her career was spent in England, including playing the lead role in David Lean's BLITHE SPIRIT (1945); she did return to Broadway periodically and in 1979 she received a Tony Award as Best Actress for her performance in WINGS. In 1974 she was honored by the Queen with a CBE (Commander of the Order of the British Empire). A detailed obituary published at the time of Cummings' death in 2005 may be read here. 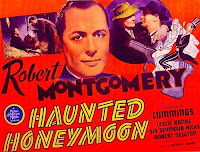 HAUNTED HONEYMOON was one of a number of movies produced by MGM in the late '30s at its British studio; incidentally, the film was released in England under the title BUSMAN'S HOLIDAY, which is also the title of the Sayers book and play upon which the movie is based. HAUNTED HONEYMOON ran into many war-related production difficulties, including original director Arthur B. Woods' obligations as a Royal Air Force pilot. (Tragically, Woods would die in an air collision in 1944.) An uncredited Richard Thorpe also worked as a director on the film. According to different reference sources Maureen O'Sullivan, Montgomery's costar in HIDE-OUT (1934), was originally slated to play the role of Harriet, but when war broke out in 1939 she returned to the United States and was replaced by Cummings. The movie was filmed in black and white and runs 83 minutes. The cast also includes Robert Newton, Googie Withers, Frank Pettingell, Aubrey Mallalieu, and Joan Kemp-Welch. HAUNTED HONEYMOON has not been released on video or DVD, but can be seen as part of the library at Turner Classic Movies. Vote on this page to indicate interest in a DVD release. I'd love to see Warners release a set of Montgomery films, or perhaps a set of some of MGM's lesser-known mystery films. April 2016 Update: HAUNTED HONEYMOON is now available on DVD from the Warner Archive. The Archive DVD presents the UK print of the film which is substantially longer than the U.S. print reviewed here. My review of the DVD is here. I've enjoyed the books but I've never seen Montgomery play the role. Sounds interesting.